It’s October 21, 2015, the day in “Back to the Future II” when Marty McFly, Doc Brown and Jennifer travel to this very date. 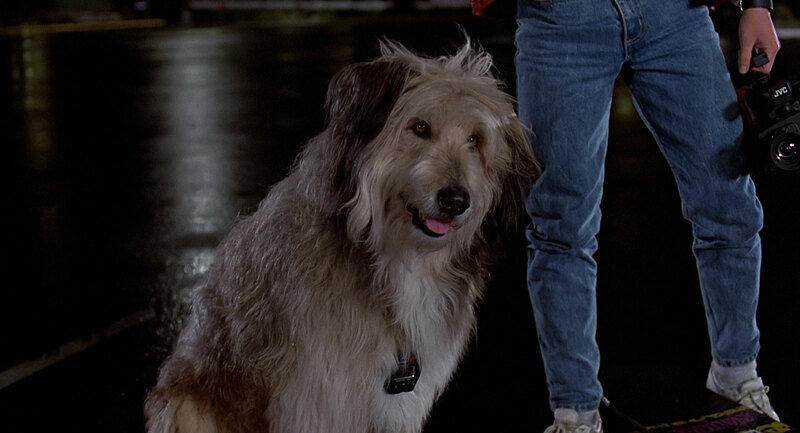 On the occasion of Back to the Future Day, we’d like to give a shout out to one of our favorite movie mutts, shaggy Einstein, who traveled into the future before Doc or Marty every did. In “Back to the Future II,” Einstein’s keen sense of smell comes in handy when he tracks Jennifer to her house. What kind of a dog was Einstein? According to Culture is a Weapon, he might be a Berger Picard, a Briard, a sheepdog or just an adorable mixed breed. According to Pajiba, Einstein didn’t do all his own stunts! A couple of long shots of the dog in the car were a stunt man in a dog suit; close-ups were the real dog. Producer Bob Gale called those scenes an homage to “The Shaggy Dog” (1959).